Take a look at some of the top energy efficient blinds and curtains available now. We give the low-down on some great cellular blinds and the best insulated curtains to help keep your home warm this winter. On average, windows cover around 15% of the surface area of the walls of a home. 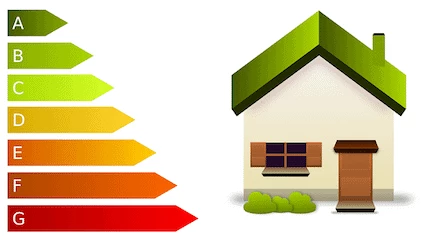 They account for more heat loss than any other part of the home, which is strange because per surface area, they are also the most expensive surface in your home. In this article, we focus on thermal curtains and cellular blinds. These are a relatively inexpensive and cost-effective way of improving the insulation properties of your window areas. They can be so effective that the U.S. Department of Energy states that these draperies can "reduce heat loss by as much as 25%". We've put together a list of the very best thermal curtains and insulating blinds available right now. We'll give the low-down on each so you know exactly what to expect from them too. We've also got some great tips on measuring and installing curtains and blinds in your home. What exactly is an insulated curtain? Why insulate your windows with thermal curtains? So how do honeycomb blinds compare to the best insulating curtains? Energy saving curtains (or insulated curtains) are special draperies that are fitted with a dense lining. The material is heavy and its density makes it perfect for blocking unwanted noise and sunlight and also retaining heat. Furthermore, in the summer months, they can keep your house cool by rejecting the outdoor heat. Studies suggest that 10-15% of energy at home is lost through windows. The EPA website further maintains that leaky windows can account for as much as 25% of your heating bill. When insulated curtains are fitted properly, they can make a big difference to the loss of heat in a room. They do so by creating an air space between the window and curtain that acts as a buffer. This airspace stops warm air (heat) from being "sucked" out of the room by the cold surface of the window pane. Reducing unwanted noise from outside. Insulating curtains are thick and therefore good at absorbing sound. The thickness of these types of curtains makes them excellent at blocking light. They are sometimes called 'blackout curtains' because of this. Reducing heat gain in the summer. Keeping rooms warm in the winter is priority number one, but ensuring that they are not too hot in the summer is another goal. Air conditioners sure ramp up the electricity bills in warmer climates. Compared to the obvious solution of upgrading your windows to double or triple panes, the cost of purchasing some new curtains is pretty insignificant. However, it's not all sunshine and roses. There is a big downside to using insulated drapes or curtains. But, you'll be happy to know that it's completely avoidable. Should you leave gaps at the bottom, sides, or top then you might have a problem. The gaps will draw the warmer air from your room into contact with the cold window where it will cool. There's also the possibility of condensation, that can create mold and damage wooden frames. Condensation can form when warm air (like that created by an insulated curtain) comes into contact with a colder surface (the window). Condensation can be avoided in a variety of ways. The easiest of which is by using a dehumidifier. Make sure the curtains are as close to the ceiling as possible. Remember air gaps are your enemy. A great way to solve the problem of air gaps is by using magnetic tape. With tape running around the edge of the curtains and also the wall or window frame, you can ensure a good seal is made when the curtains are closed. Magnetic tape is relatively inexpensive and easily available. Getting curtains that reach the floor will also eliminate any draughts down below. Hanging 2 sets of curtains will improve the energy efficiency even more. Make sure there are no "leaks" coming from the window. Old caulking needs to be replaced to stop air from traveling through. Getting the right size of curtains for your windows is crucial in ensuring efficient insulation. Ideally, you don't want air gaps at the top, bottom or sides. As we mentioned before, a great way of doing this is by lining the curtain and wall/window frame with magnetic tape. That way a seal is easily made between them. Sizing new curtains isn't always as easy as it may seem, so if you're doing this for the first time it might be worthwhile checking out this video. It's only a few minutes long and it tells you everything you need to know about measuring your windows and getting the appropriately sized curtains. For the purpose of heat insulation, curtains that reach the floor are most desirable. These are the 3 sets of insulating curtains that we recommend. They come in a variety of sizes and styles so we're sure you'll find a set that suits your home. The FlamingoP range of thermal blackout curtains earns rave reviews on consumer sites. They come in a variety of sizes and styles and are made of 100% polyester. Being made of polyester means they are completely machine washable and easy to take care of. This is a real plus in a house containing young kids! The curtains are much heavier and thicker than your usual set, which makes them perfectly adept at blocking sunlight and also noise. Their design also ensures heat-loss in the household can be massively reduced. FlamingoP throw out figures like "blocks 95% sunlight" and "filter approximately 70% of the sound" which seem pretty hard to verify, but a quick look at the reviews on Amazon shows that the overwhelming majority of customers are very happy with their performance in these areas. They come in as standard as a 52" width set, but multiple lengths are available. They feature 8 grommets lining the top, each with a diameter of 1.6". These should fit most standard curtain rods or even more decorative rods. Style-wise they aren't the most elegant in the world, and I would rate them as a 7/10. But, it's their functionality that makes them stand out. If they make a difference to your quality of life (with regards to sleeping, warmth, or noise) then aesthetics aren't so important anyway. These Deconovo curtains are another made from 100% polyester. The triple weave design makes them incredibly thick and heavy. They actually clock in at 230 GSM (grams per square meter) in weight. These are ideal properties for energy efficient curtains. Furthermore, the dense nature of the triple weave design means no light can penetrate the material. The Deconovo range comes in three size options. They have a standard width of 42 inches with lengths of 63, 85 or 95 inches. If you missed our buyer's guide, we recommend always going for a length that reaches the floor (unless you can block the air space at the bottom another way). The 42-inch curtains feature 6 grommets on each panel. The grommets have a diameter of 1.6 inches. This should provide adequate space to fit on most curtain rails. The styling of these curtains is very simple and neutral. They come in a large range of colors with no patterning, just plain color curtains. Be aware that the darker colors will block sunlight more effectively than the lighter shades. The polyester material is fully machine washable to make life easier. Just make sure it's a cool wash and don't machine dry them. Nicetown curtains are another that will reduce noise and sunlight, while at the same time insulate your home better. Like most others they feature 100% polyester, triple weave construction. The Nicetown range comes in a variety of color choices with plain styling. Nicetown state that the darker colors can give up to 99% sunlight reduction, while the lighter shades more like 85%. The color only affects the light reduction, with insulation and noise reduction properties remaining constant thought the color range. A single curtain panel features 6 grommets with a diameter of 1.6 inches each. This size will fit standard curtain poles no problem. The curtains come in a variety of sizes with both long and short options available. The curtains are completely machine washable and may even be machine dried and ironed on a low heat setting. Blinds aren't always the first thing thought of when it comes to improving energy efficiency. However, new technology means that blinds can now be considered a solution for unwanted light and also a great way of retaining household heat. But, we're not talking just any old blind here, specifically, we mean honeycomb blinds. Honeycomb blinds get their name from the honeycomb pattern they have. The hexagonal pockets of air are the vital component that makes them a viable tool in improving energy efficiency in the home. These cellular air pockets insulate against heat and cold. They reduce the temperature transfer between the window and room by creating this barrier of air. 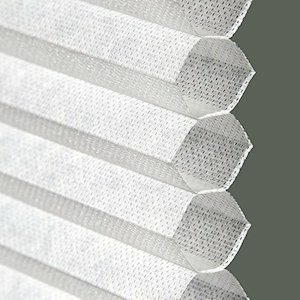 Cellular shades (or honeycomb blinds) can offer even more effective insulation as the number of cells (air pockets) and the size of the pleats increases. These shades are also incredibly good at providing complete privacy. Some can even block out unwanted light too. Another thing that these have going for them ahead of curtains is that they can be raised or lowered to cover just a couple of inches at top or bottom. The fact that they can be top-down (as well as bottom) means you have so many options with regards to the amount of light you let in and also your level of privacy. Let's take a look at how the two products stack up against each other in the key areas. We'll choose a winner in each category. Thermal Efficiency - To measure how effective a material is as insulating we use something called an R-value. The R-value is a measure of a material's thermal resistance. Basically, the higher the number the better something is at insulating from the cold. Standard curtains and blinds have a value of around 1. The best insulating blinds typically provide insulation ranging from R2 to R5. Thermal curtains give R3 to R5. This number can be increased by making the material thicker. We can do this with curtains by double hanging them. We can't do this with blinds. Privacy - So which give the greatest degree of privacy in the home? This one is a clear win for the blinds. The best cellular shutters work on a top down bottom up principle. This means they can be lowered from the top or raised from the bottom. This gives you the option of letting light in the top while maintaining a degree of privacy. Noise Reduction - This one isn't even close and it's a clear win for the curtains. Noise is reduced by using very dense materials that absorb sound waves. Blocking air gaps is also very important when reducing unwanted noise. These two things can only happen with curtains. Firstly, these curtains are incredibly dense in construction. This makes them great at absorbing high-frequency sound. Secondly, they can be installed to cover air gaps much more easily than with blinds. A great tip is to use magnetic tape to line the edges of the curtains, so they can "attach" to the wall or window frame. Light Reduction - Due to their dense construction, insulating curtains are better at reducing unwanted light. However, special light-blocking cellular shades are available too. Curtains win on thermal efficiency, noise reduction, and light reduction. Blinds are better for privacy. In conclusion, the curtains run out winners by 3-1. However, it really depends on your individual needs. Blinds can provide options that curtains just can't give. Furthermore, the best insulating blinds can give curtains a real run for their money. But, if we're talking value for money then definitely go with the curtains. Next, we take a close look at some of the best cellular shades available right now. We discuss the key details before giving our opinion too. These shades do not include installation but are cut to fit your window measurements. Installation is pretty straightforward and we'll take you through that too. These range of cellular shades reviews really well on stores like Amazon. They are 100% polyester and made in the USA. They feature the 'top down bottom up' system that makes these kinds of blinds stand out from the rest. Unlike regular blinds that must be raised from the bottom up, these have the option to drop down from the top too. This means you can obscure any section of the window that you wish while letting in sunlight at the same time. This allows you to adjust them as the sun's position changes to allow optimum sunlight while retaining a degree of privacy. This is all done with a cordless design that makes them ideal for homes with small children. These shades are available in a huge variety of sizes, but can also be customized up to an 1/8th of an inch. The company follows up every order to ensure that they get the most precise of fits. They're also available in a range of attractive colors. The darker colors are better at blocking sunlight but absorb more heat. These cellular blinds don't have the top down bottom up feature of our last recommendation, but that makes them a whole load cheaper. Fitting a whole house is much more affordable if you're willing to forego the fancier top down bottom up function. These are also cordless and comply with Consumer Product Safety Commission Standards (CPSC). Despite being cordless they lose none of the functionality or ease of use and are importantly much safer for family homes. These blinds come in a variety of sizes, but to my knowledge don't come with the same customization options that the previous blinds do. They too have to be installed by the customer, but this shouldn't present an issue (read on to see how they are installed). The necessary hardware and brackets are included with the shutters. You can find cut to measure blackout shutters from Bali Blinds here. You can also check out some cellular shades consumer reports there too. The cellular blinds reviews are very positive. Installing cellular shades is really simple and should take just a few minutes. You'll need a tape measure, a drill, and a flat-head screwdriver. The easiest way to see how to install these energy saving blinds is by watching this 5-minute video. The installation process is the same for pretty much every brand of shades. Just remember to take your time when measuring the size of shades you'll need. We hope you've found our resource on energy efficient blinds and curtains useful. We also have guides on energy efficient heaters and ceiling fans that you may find interesting. Follow us on Facebook or join our mailing list to stay connected. We regularly post new articles about green living and space saving ideas.